Our charity this year is Fat Fluffs Rabbit Rescue – they were kind enough to send along some material to explain how the charity got started, and the work they do. Read on to learn more! Fat Fluffs Rabbit Rescue and Rehome was started in 2006 by 6 bunny mad friends. There were, at that time, estimated to be 32,000+ rabbits in rescue across the country, unloved, unwanted, mistreated, sick and dying but today there are currently over 60,000. And these are just the ones lucky enough to have found themselves in a rescue situation. Our hearts went out to them when we took in our first unwanted rabbit, Charlie, we knew this is what we wanted to. 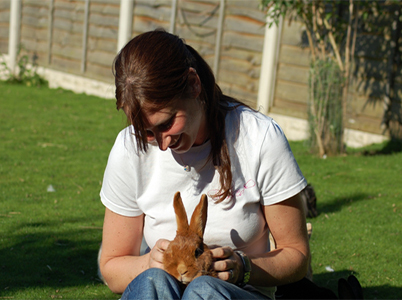 Over the next couple of years we made many friends through the bunnies and in 2008 we registered Fat Fluffs as a charity simply to help cover the escalating monthly vet bills. Since then we have helped rehome, rehabilitate, treat and love many rabbits as well as offer support to those who have, as a result, been able to stay in their own homes. Rabbits are handed in to us for all sorts of reasons, from genuine forced moves or family break ups to just because the owners are tired of caring for them, kids are bored of them, vet bills are an expense and sometimes just because rabbits are seen as a replaceable commodity. 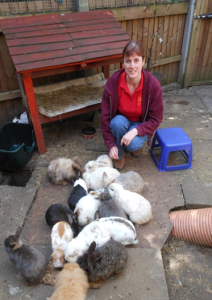 Our original set up was very quickly outgrown by the number of rabbits needing a rescue space and for the last four years we have been fundraising and writing grant applications to create the funds to enable us to move. Last June we were awarded a substantial grant from Support Adoption for Pets and, along with our combined fundraising efforts, we were able to achieve this goal. We moved to Hampton in Arden in October 2014 and we have been busy ever since getting our new accommodation in place. We are passionate about animal welfare and have worked closely with a local rabbit house manufacturer to come up with the ideal place for our bunnies to live. We are really happy with the results and the rabbits seem happy with them too. We are indebted to all our supported and volunteers who have made this move possible. Fat Fluffs is not just about the rabbits. It has brought many people from the local community together. Our volunteers are animal passionate people wanting to help make a difference. We work closely with Solihull College and they are keen for their students to be able to get hands on experience with us and learn how to care for the animals to help further their future careers and we also have two apprentices working with us with the aim of furthering their careers in Animal Care. Some of our volunteers are currently out of work for various reasons and enjoy spending time with the animals as well as the other volunteers, we also have volunteers who support us in different professional areas such as book keeping and internet and from these roles we have been able to give references and helped several of our volunteers back into a paid working role. Some of our volunteers are full time workers who give us their invaluable spare time in various different roles we are incredibly gratefully to each and every one of them. 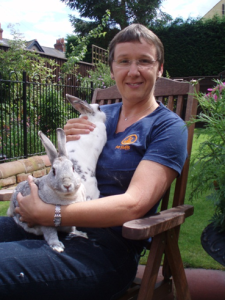 We also have other off site volunteers who go into schools, children’s groups, local and charity events to actively promote what rabbit rescue entails, what we do and to teach young people and adults how to care for their animals. They demonstrate grooming and handling, feeding and cleaning and encourage the groups to interact with the animals, and how to do so. In these endeavours we have enjoyed the support and encouragement of our local community, Mayors, MP’s, local artists and local businesses and indeed local Castle Gallery Washington Green signed artists Peter and Jayne Smith are not only the proud owners of three Fat Fluff bunnies but are also patrons of our charity. Alongside external advice and encouragement we also offer verbal support over the telephone. People who have been struggling with various issues with their animals can give us a call and I talk them through different scenarios, encourage them in what they are doing or suggest veterinary care as needed. We work closely with other rescues, similar to ours across the country as well as the RSPCA and have, on several occasions, been in a position to be able to take on some cruelty cases that have been in need of urgent rescue spaces. We also work closely with our local veterinary clinics and have taken in strays handed in to them as well as healthy rabbits that have been requested to be euthanized by their owners and given them a second chance. All the rabbits that come into Fat Fluffs are given the best care we can possibly give. We believe in a quality of life for our rabbits and will always do our best by them and work closely with Damson House Vets, Oaks Vets and Easipetcare (to name a few) to ensure they get the best chance possible; any rabbits that cannot be rehomed for whatever reason, be it long term health concerns, temperament reasons or even due to their age, they are given a permanent sanctuary home with us for the rest of their lives. We do have a euthanasia policy; we will ensure our rabbits are given every chance to have a quality of life but, if we believe and are supported in this belief by our vet, that this is no longer the case then we will not allow them to suffer and will make the decision to do what is best for our rabbit. We have over the last eight years committed ourselves to giving unwanted and neglected rabbits the best we can and, as the growing need for rabbit rescue has unfortunately increased so rapidly over the past few years, we hope to do so for many years to come. Whilst in a perfect world rabbits would not need this rescue situation and those domesticated would be taken care of as they should be, we believe every bun deserves a second chance and we want to ensure that as many as possible get that chance.